Compared to the rest of the world, Canadians are lagging behind when it comes to Internet prices. But whereabouts in Canada are people really paying the most? The Yukon. Take a look at the following inclusion of Northwestel versus the world (here’s the original graph) added by Yukon journalist, Andrew Robulack. The pillaging of Yukon residents by Northwestel will bring you nausea beyond belief. But, even so, itâ€™s worth pointing out that at this level of costÂ Yukoners receive less service than anywhere else in the world for a far greater cost. And not just by a bit, but by a significant margin. By how much is Northwestel marking up data to Yukon residents? 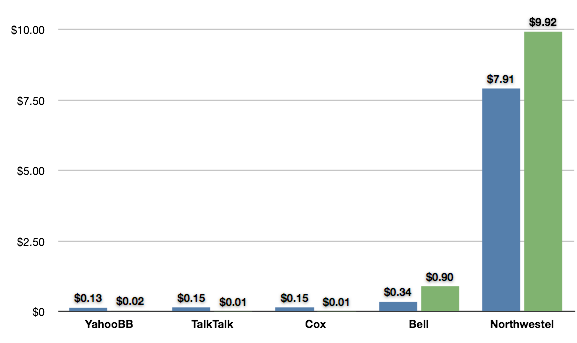 3Â¢ per GB [the ‘true cost’ to Internet providers]? Thatâ€™s a chilling number, when you consider that Northwestel resells it to internet customers for $10. In a nutshell, that means that Northwestel marks up the cost of the data that it doesnâ€™t even provide, but merely transmits, at a rate of 33,233%.